The goji berry is an excellent superfood to add to your next smoothie. Not only do they provide you with protein, trace minerals, and an assortment of other nutrients, they taste great! The mild, tangy flavor of these small, pink berries will add an interesting taste of sweet and sour to your next smoothie. Don’t stop at smoothies, though. You can eat these berries plain as a snack, in a trail mix, on your oatmeal, on a green salad, or in a tea. Goji berries are also known as wolfberries. The berry is reddish pink and grows on an evergreen shrub that is native to Asia and southeastern Europe. The plant, called Lycium barbarum, is in the nightshade family which also includes tomatoes, potatoes, eggplant, and chili peppers. The berries are usually sold and consumed dried. Most goji berries are cultivated on plantations in China. The production of these powerfully nutritious berries has increased greatly over the last several years as western culture has discovered that they are packed with a variety of important nutrients. The health potential of goji berries may be new in the west, but in China, Tibet, Nepal, and India, people have appreciated this berry for millennia. The first references to the berry date back at least 2,500 years and refer to it as a nourishing food that replenishes the spirit. Since that time, there have been many more historical references to the health properties of goji berries, in particular their longevity promoting properties. The western world has finally caught up to eastern culture and medicine and has realized the potential that goji berries have to be a superfood. These tangy fruits are stocked with protein, minerals, vitamins, as well as potent phytochemicals and antioxidants. Give these little berries a try in your next smoothie to add flavor and nutrition. The numerous health benefits of these tasty berries truly place them right at the top of superfoods list. As matter of fact, superfood guru David Wolfe lists them number one in his book, Superfoods: The Food and Medicine of the Future. They contain protein, vitamins, healthy fats, trace minerals, antioxidants and more. For thousands of years, the Chinese have associated this food with health, vitality, and long life, and now modern science is figuring out why they have always been right about the goji berry. Eye health: The carotenoid compound zeaxanthin is plentiful in goji berries and is an important nutrient for good eye health. People who consume this molecule have a lower incidence of macular degeneration related to aging. Zeaxanthin is also the compound in the berries that is produces the reddish color. Longevity and anti-aging properties: The fruits of the goji plant have long been associated in China with longevity. Modern research has found that certain oils in the berries, called sesquiterpinoids can increase your production of human growth hormone. No other plant has been shown to have such an effect on these hormones. As you age, your production of this hormone decreases. By consuming the berries, you can up the production and may see the anti-aging effects in your appearance and overall health. Heart disease: Consuming goji berries has been shown to increase the amount of an enzyme in the human body called superoxide dismutase. This is the enzyme that prevents cholesterol from oxidizing. In its oxidized form, cholesterol is harmful to your heart and contributes to heart disease. By eating more goji berries you can lower your risk of dangerous heart conditions. Immune system: Thanks to three compounds present in the berries of the goji plant, you can help to boost your immune system by eating them. The three compounds are beta carotene, the mineral germanium, and polysaccharides. Beta carotene helps to stimulate your thymus gland, which is part of the immune system, germanium is known to protect against some types of cancer, and polysaccharides are compounds that improve the functioning of your immune system. Antioxidants: These beneficial compounds, which include vitamin C, zinc, and copper, that protect our DNA abound in goji berries. Free radicals that exist in your body are highly reactive and will mutate the DNA in your cells causing damage, aging, and even cancer. Antioxidants neutralize and destroy these free radicals and goji berries contain more than many other foods including red grapes, strawberries, and broccoli. Autoimmune disorders: One in five people in the U.S. suffers from an autoimmune disorder. This means that the immune system, which should attack invaders in the body like viruses and bacteria, attacks the body’s own healthy cells instead. The polysaccharides that are found in goji berries provide your body’s cells with specialized sugars that help your immune system to better distinguish between normal cells and invading cells. People with autoimmune disorders report finding at least some relief from symptoms when they add goji berries to their diets. Minerals: Our bodies require many different minerals to operate correctly and some of these are needed only in tiny amounts. These are called trace minerals and goji berries supply several of them. In addition minerals needed in larger amounts like iron and calcium, goji berries also have copper, zinc, magnesium, phosphorous, germanium, and selenium. Are there any side effects of eating goji berries? Goji berries are considered a very safe food to eat, in addition to being so nutritious. However, there are a couple of possible interactions that should be avoided. Goji berries can interfere with blood thinners like warfarin. If you take this medication, you should not eat the berries. As with any type of herbal supplement, you should consult with your doctor before using goji berries if you have any concerns. In what form can you buy goji berries? You will mostly find goji berries at natural foods stores or online in their dried form, similar to raisins. You can also find juices and teas made with goji berries. These may have other ingredients as well, so stick with the dried fruits if you just want goji berries. How can you consume goji berries? When you buy the dried berries, use them in any way you would use any dried fruit, like raisins. Eat them plain, add them to trail mixes, bake them in breads, soak them in water to make a tea, and of course, add them to your smoothies. Have there been false claims about the health benefits of goji berries? Yes. When goji juice became popular on the health food market a few years ago, some manufacturers made some bold and misleading claims. This included claims that the juice made from goji berries could prevent breast cancer and misleading statements that the juice could be used as a treatment for diseases. There are many nutrients in goji berries that are proven to help protect your body from cancer, but they are not a cure or a treatment. Do goji berries need to be washed before eating? You may notice on your package of berries that it says to rinse before consuming. Often, the berries have been sprayed with chemicals and they need to be rinsed. Try rinsing them in water with a splash of white vinegar. Just be sure to rinse well again so you do not taste the vinegar later. Add a natural sweetener if you prefer more sweetness in your smoothies, although the berries in this recipe may be enough for you. If not, try a tablespoon of honey or a little bit of stevia. Blend all of the ingredients together until you get the consistency you like and enjoy your superfood smoothie. What is your experience with goji berries? Please divulge in the comments below. If your local health food store is worth its salt they will have goji berries. If you want to purchase them online, I recommend Mountain Rose Herbs or Live Superfoods. I have a bag of dried goji berries. Should they be kept in freezer to use as a frozen fruit? Ron, dried goji’s can be kept a room temperature, preferably out of the light. Enjoy! I was wondering what your recommended dosage is for Goji extract (in milligrams)… Most literature out there says 500-600mg. What are your thoughts on that? I don’t have personal experience with any goji extracts. Therefore, I advise using the product’s recommended dosage. We use goji berry to improve eyesight / maintain the eyesight after 40s, the dosage is about 1 spoon full, (around 25 dried berries) daily. it’s also proven to improve sleep and prevent drowsiness during the day, even after a late night sleep. my big brother’s (56 y/o) eyesight improved alot, now he could read without any glass, he have been taking goji berries for about a year. I read recently that goji is benefical for preventing macular-degeneration. How often and how much should be used weekly in smoothies? I am 80 and have very early stage macular so perhaps I will never experience it. My doctor didn’t think I had to do anything. 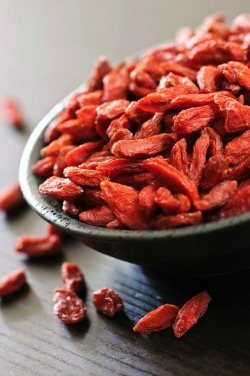 The recommended dosage for goji berries is one small handful a day. You can add to smoothies, salads, trail mixes, or consume straight. Indeed, goji berries are fantastic! I just bought goji berries as a benefit for liver health. Last time i bought them, they got “buggy” in the cupboard. But, all the sources say it’s ok to store them dry at room temperature. I live in Ohio (almost winter and not humid at this time of year. Thanks! Enjoy, Pat! They should keep for a while stored like that.